In June of 2005, a group of Port producers held a tasting in Bordeaux celebrating the 50 years between the 1963 and 2003 with a tasting of those celebrated vintages. It was one of the many side events surrounding VinExpo 2005. I had just spent a week tasting Champagnes. I know, poor me…my tongue was suffering the ravages of acidity and tiny bubbles. After a couple of sips of Port, at 19 or 20 percent alcohol, my tattered tongue was aflame. I was about to give it all up, when I arrived at the Quinta do Noval table. It’s impossible to say “no” to Noval-- especially when offered by the urbane and engaging Christian Seely, evangelist-in-chief for this historic property. I was amazed to find that with these wines my tongue had no complaint. I related this experience to Seely during a visit to the Quinta last fall sponsored by AXA Millésimes, the branch of the multi-national insurance company that owns Noval and other wine estates. He was amused by the story, but not surprised. His answer to the puzzle? Balance…from the vineyard to the wine. Seely clearly loves this estate. He went to work for AXA Millésimes in 1994 the year after the company acquired Noval. 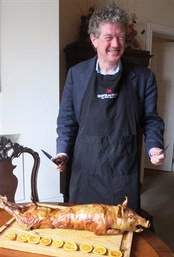 He lived at the winery until he was moved to Bordeaux to become the Managing Director of the AXA wine properties in 2000. The move included a great opportunity, but “I left part of my heart here,” said Seely. It’s easy to see why. The landscape of the Douro Valley is breathtaking, with terraced vineyards climbing the steep, schist-laden rock slopes. It is rather isolated; in fact, it was the 1960s before electricity was available in the area. 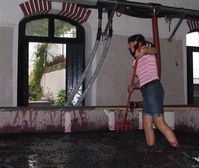 As a consequence, much of the traditional wine making was a hands-on process--or, in the case of pressing the grapes, a feet-on process. At Noval the top wines are still crushed by foot in a large rectangular concrete tank about 3 feet deep called a lagar. Harvest workers dressed in short pants, but no shoes, march slowly side-by-side, arms wrapped around each other’s waists, back and forth across the lager. Many quintas including Noval also use auto lagars to automate the process for some wines. AXA bought the property in May 1993. “It was very run down and had not had a good reputation for a while, although it still had a reputation for past vintages,” said Seely. His mandate was “to polish the jewel and bring it back.” The estate name began to appear in written records in the early 1700s. 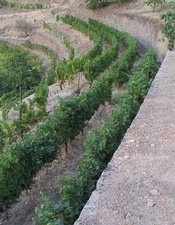 In the 1890s Luiz Vasconselos Porto broadened the narrow terraces where vines were planted and built the distinctive whitewashed walls. The goal was more efficient use of land space and better sun exposure. 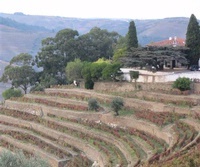 His father-in-law, António José da Silva, took over the property in 1894 and replanted vineyards destroyed by phylloxera. Under Seely’s management beginning in 1994, they began the jewel-polishing by replanting nearly 250 acres. 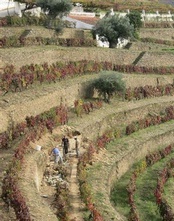 “We just dug it up and replanted with Touriga Nacional, Touriga Franca, Tinta Roriz, Tinto Cão and Sousão,” said Seely. The new vines were planted in varietal blocks to ensure the optimum growing conditions for each variety, rather than inter-planted field blends. This also means that each grape variety can be harvested at optimum ripeness. “The quality of port has never been better,” said Seely. He credits this to improved practices in the vineyards and the winery. He notes that vintage port has traditionally been aged because it was not particularly pleasant to drink young, a condition he blames on the quality of the fruit. “Sorting tables were not here 20 years ago, so a lot of other things got into the fermentation vats along with the grapes. Now there are no rough edges, so they are more agreeable to drink young.” He notes that today’s market reality is that there are not many people who can buy a bottle of wine and age it for twenty years. “I have some regrets that people don’t think about aging a wine,” he lamented. The heart of the estate is the Nacional vineyard, which is both a national and natural treasure. The vines of the nearly five-acre vineyard are un-grafted, meaning they grow on their own roots. Somehow, this small slice of soil is not hospitable to the voracious root louse, phylloxera. Certainly the Douro suffered the ravages of this pest imported from the USA as did the rest of Europe’s vineyards in the mid-to-late 1800s. The only remedy is to graft the louse resistant rootstock of native American grapevines onto European Vitis Vinifera vines. But, not here. It is called Nacional because indigenous grapes are anchored in Portugese soil on their own roots. According to Seely, it always gives a different wine than the grafted vines, although not always better. We had the opportunity to taste a few vintages of most of the Noval range. Two themes became evident to me: Elegant balance and a wild, dusty herbal quality to the fruit. I must admit that I am not a huge fan of Ports, although I love the dry Douro reds. What I like about the Noval wines is that they’re not just about sweetness and power. They are intense, yet balanced and almost delicate with ripe fruit interwoven with savory, herbal, umami flavors. Cedro do Noval is named for the immense cedar, thought to be about 150 years old, stationed in the front of the quinta’s main building. It carries a regional appellation because Syrah is a part of the blend, a successful experimental planting. Cedro do Noval, Vinho Regional Duriense 2009 ($20) was well balanced, linear and savory with black fruit showing a touch of iron. Tannins were tight but not astringent. The 2010 ($20) was distinguished by its brightness, elegant structure and intense fruit with a light herbal note. The Duoro, Tinto 2009 ($90) was linear with dense dark fruit, savory and herbal with a touch of iron, while the 2010 ($90) was bright on the palate with herbal aromas and notes of green peppercorns mingling with the intense black fruit. The Douro Touriga Nacional 2011 ($95) is an unusual varietal bottling of this grape and I don’t think it’s available in the US. It’s dusty in the nose with lovely raspberry jam fruit, solid tannins and a bright citrusy finish. It shows great balance of dense fruit, chewy tannins and citrusy acidity. Much more elegant than I expected, the raspberry fruit reminded me of Pinot Noir. The Twenty Years Old Tawny Port ($76) was the standout of the tawnies: seamless and elegant. Sweet, but not cloying with caramel and nutty flavors. Vintage Port 2008 ($200) was showing that raspberry jam again, with spices and a bit of soy sauce, delicate on the palate, balanced and integrated. Regarding the Nacional Vintage Port 2011 ($1,400) one must ask…is it worth it? It’s certainly a piece of history, from a treasured vineyard in what is considered to be a great Port vintage. While it was a bit subdued, savory and herbal flavors were woven into the dusty mineral, black fruit. It was massive, yet elegant; intense, yet ethereal, sure to develop and evolve for decades to come.